Utu is a 1983 New Zealand film directed and co-written by Geoff Murphy. Anzac Wallace, who had done little acting up until that point, takes the starring role of Te Wheke, a warrior who sets out to get vengeance after British forces kill his people. The cast also includes Bruno Lawrence and Kelly Johnson. 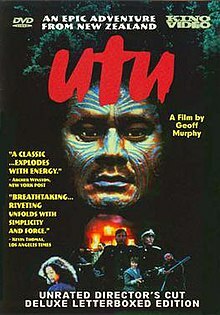 Sometimes described as "a Maori Western", Utu was reputed to have one of the largest budgets for a New Zealand film up until that time. The film screened out of competition at the 1983 Cannes Film Festival, and became the second most successful local movie released in New Zealand to that date. Positive reviews in America, including a rave review from Pauline Kael, helped win Murphy directing work in Hollywood. Partly inspired by events from Te Kooti's War, the film tells of a Māori soldier setting out to get utu, or vengeance, on his former allies after the British army destroys his home village and kills his uncle. The film is set in the 1870s. In 2013, partly thanks to the longtime existence of an alternative cut of the film aimed at international audiences, which Geoff Murphy had never been happy with, he completed work on a restored and recut version. Utu Redux, as it is known, premiered at the Wellington International Film Festival on 26 July 2013. Set in New Zealand's North Island during the New Zealand Wars, Utu follows Te Wheke (Anzac Wallace), a Maori Captain in the British army. When Te Wheke's unit comes across a village that has been slaughtered he, recognising it as his own, deserts the army and organises a guerilla force to terrorise the invading British forces. When the unit destroys the home of Williamson (Bruno Lawrence) and kills his wife, Williamson vows to hunt down Te Wheke and kill him himself. Meanwhile, army scout Wiremu (Wi Kuki Kaa) and recent Boer War veteran Lieutenant Scott (Kelly Johnson) aim to track down Te Wheke themselves, also using guerilla warfare techniques against the will of corrupt Colonel Elliot (Tim Eliott). Production of Utu was one of the largest film productions to have taken place in new Zealand until that point. Its grand scale warranted the use of a large second unit, which again was rare in the context of a young New Zealand cinema. During production Murphy was very interested in authenticity, trying to keep it as period accurate as possible. To accomplish this many of the extras used were local Maori and in order for Te Wheke's moko to look realistic, Anzac Wallace would spend 4 hours having it applied each day of shooting. The film's immediate reception was less positive than Murphy's earlier works, although still positive. Locally the film was very commercially successful, being New Zealand's second highest-grossing film at the time (behind Murphy's previous effort, Goodbye Pork Pie). ^ "Festival de Cannes: Forbidden Relations". festival-cannes.com. Retrieved 2009-06-22. ^ a b Martin, Helen and Sam Edwards. New Zealand Film: 1912–1996. Oxford University Press, 1997, p. 87-88. ^ a b "Utu". NZ On Screen. Retrieved 26 June 2015.